Think Mumbai and think snacks and the first thing which will come to your mind is likely to be vada pao. This spicy potato chop in a bun is iconic stuff, almost a logo for Mumbai. The rare vegetarian snack which even had Anthony Bourdain go weak in his knees. And that's no mean task. But there's to more to local snacks than vada pao. I would know. I spent most of my working life at Mumbai at Dadar and now, the exotic sounding, Chinchpokli. Both are Maharashtrian dominated localities of Mumbai. These were once the mill lands of Mumbai. The mills have gone defunct and have given way to plush office complexes and malls. These are a bit like swank oases in the middle of dusty, desolate, dug up roads. There are no eating joints of note close to where I work. Barring a place called Sardar. Sardar is a vegetarian, Maharashtrian place which serves a medley of Maharshtrian snacks as well as South Indian stuff and now, as they proudly proclaim, ice tea and garlic bread! It is an economical, spartan operation typical of Indian cities. Tables and benches, often shared during rush hour... sit, eat and go. Nothing fancy, no air conditioning. The fast off take and the busy cleaning boys are your biggest hope to good hygiene levels. Sardar won in the 'best missal pao' contest of local tabloid, Mumbai Mirror, a couple of years back. A certificate on their wall proudly announces this. 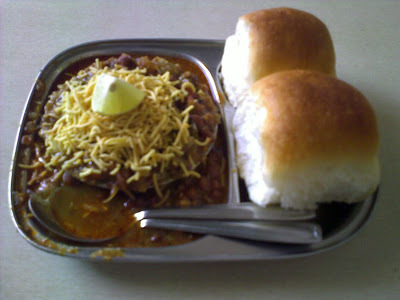 Missal pao has been a favourite of mine ever since I've moved in to Mumbai. I first had it in my office canteen for breakfast ten years back. Missal is a gram flour based deep fried fritter, also known as farsan by Gujaratis. This is mixed with a chick pea curry which is slightly tangy and mildly spicy. The result is a very interesting blend of crisp, crunchy bites of the missal interspersed with the mushy, oily bites of the chick pea curry. You normally squeeze lime into it, add chopped onion (only if you are sure that you won't get lucky later in the day) and have it with pao, the local soft bread. I stepped into Sardar a few days back and had missal pao for lunch. 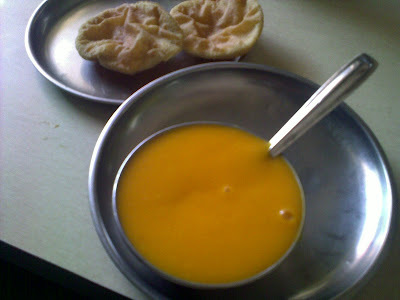 I followed this with a summer favourite called aamras. Aamraas is a big local favourite which is a nectar like dish made with mango pulp, milk and sugar. This can't be made with any mango! It has to be made with a strain of mango called Alfanso. Everyone here is very proud of Alfanso or hafoos as it is called in Marathi. Alfonsos are grown in the Ratanagiri district of Maharastra. These very sweet mangoes are the only mangoes which locals think are worth having. Aamraas has to be had chilled. There are very few things which can beat the summer heat like a nice chilled aamraas can. I can't think of any. A classic combination is to have aamraas with puris (fried rotis made with a mix of wheat flour and flour). This trip to sardar was completely unplanned but it happened to be Kainaz's granny's birthday. Granny passed away last October. She used to love aamraas and it was as if she willed me to go and have it from upstairs! Note: this filling and varied meal of missal pao, aamras and puri cost me a princely sum of Rs 52 or 1 USD! Ahhh I hate you.......one after another favourite :(. i'll die to eat the vada poa right now. I love the one at kala ghoda. It's a small tapri on the footpath just near the signal where American Express bank is. Not sure if it is still there now. They have the most amazing garlic powder chutney that goes well with the vada poa. 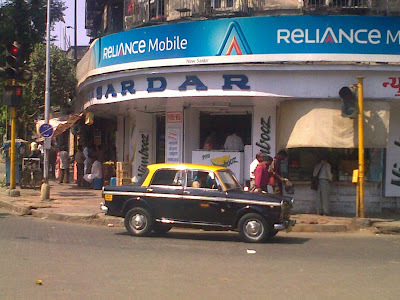 I can't believe you've put in a post on 'Sardar', complete with pictures!!! I'm going to die!!! It's not the 'only restaurant of note' in that area, it's 'the' only restaurant! We used to go to Sardar frequently as well & the owner used to shove the certificate for the best misal pao in my face almost every time!!! @ A: hope you get to make a trip back soon. I used to feel as horrid when I would think about the street food of Calcutta at Mumbai. Then made my compromises - paani puri with only alu and khatta paani. Rolls that I'd make at home with sauted chicken and frozen parathas. I still miss 'dalmut' our spicy farsan. 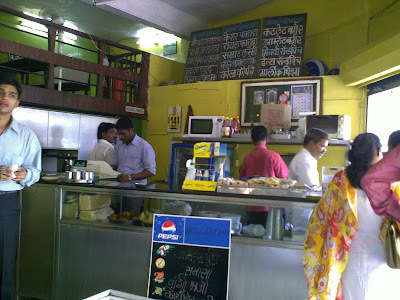 My favourite vada pao tokdi was the one opposite LIC at Churchgate. I used to pick up stuff from here while walking back from work years back. I discovered a nice tokdi near my office yesterday. I bought 6 vadas to take to my in laws house as I was going there. The tokdi guys packed up after that as the police were coming. My pa in law said that he felt like a 'light' dinner and had 5 vada paos and a Chocobar! Wonderfully put Kashi. Bombay can be bhelpuri but Mumbai has to be vada pao. For those who didn't get the context, vada pao is a Maharashtrian dish, as is the name Mumbai. Bhel puri is made by immigrants from UP and Bombay was the anglicised name of Mumbai. I will definitely try the place you mentioned. I forgot to say that the ingredients at Sardar included some chopped potatoes too. Scarlett...I guess your new office would be so different as it is probably the only research office in India which is in a high street. 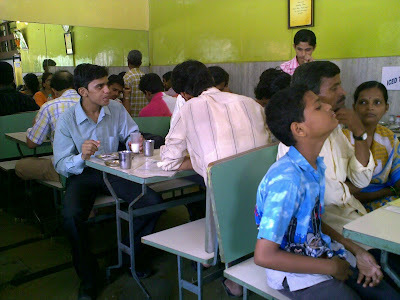 Though it was in a different place years back where the closest place was a joint called Jivan Dhaba which was famous for its anda bhurji, daal and rice and was as basic as Sardar. The Sardar fellow never flashed the certificate at me. He probably reserves that for pretty faces :) I saw it on the wall. Kashi...I didn't know that missal pao could be a full blown meal. I associated it with the channa and farsan mix that we used to get at IMRB. I am big fan of crispy stuff so it worked for me. I hadn't heard of Piyush before but I wonder whether it is the stuff that one would see outside dadar station, displayed in glasses. One story that I heard about pav bhaaji was that it was invented for cotton traders at Mumbai before independence. Gujarati traders would come to the exchange and wait for it to open. A snack guy got the idea to mash all the vegetables that he had and serve it with pao. Misal is definitely not a full meal...the ingredients that I mentioned are bare minimum , but it definitely gives it a different taste... much different that what you have been eating at IMRB..
Food can be so wonderfully nostalgic. How can i not post a comment on our very own Sardar!!!!! The daal khichdi there was quite nice!!!! We always used to end up there.. sardar and sangam ... not too many options to select from!!! That's my point Moonshine. The owner has never greeted me. Vanita, I went to Aswad years back when i was still at PQR. I don't have the foggiest notion of what we ate. I was a young, strapping Bong staying in a vegetarian PG, not pleased about going to a vegetarian restaurant. Sardar maybe OK for Misal. But it seems you are yet to discover New Anand about a kilometer south. just saw this post of yours. funny thing. there was some physiotherapist guy around the corner, i used to bring my grandma to for like two weeks years ago. there was always a narrow spot to park my car and then nothing to do for like 30 mins. so i used to come around to sardar and have a different dish each day with a mangola, i even tried their fasting foods. fun two weeks.. years before i started blogging.